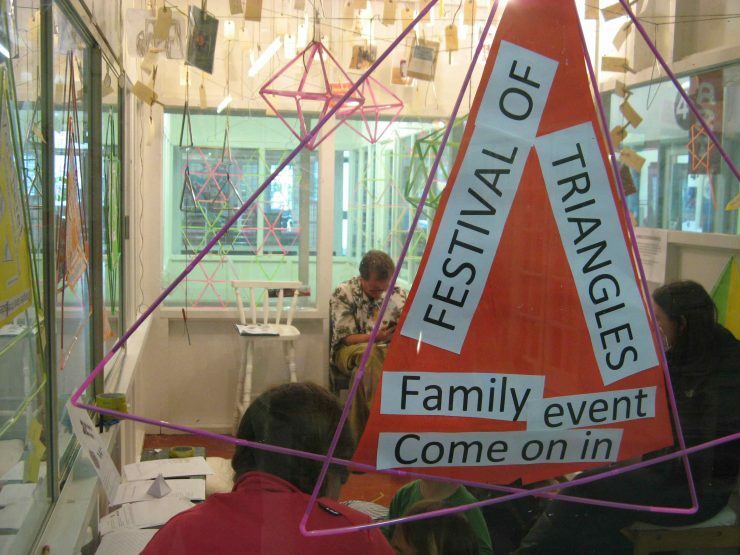 Our first Festival of Triangles was a one-day event in an empty shop in an indoor market, aimed at 5-12 year olds and their families. The space was decorated with triangles and shapes constructed from triangles, and there were also ‘triangle facts’ to read and discover. Visitors could take part in a range of craft activities. Volunteers showed visitors mathematical objects, asked their opinion on maths-related questions and helped them with activities. More than 30 people attended the event and most groups had one or two adults and one to three children aged from 2 to 12. 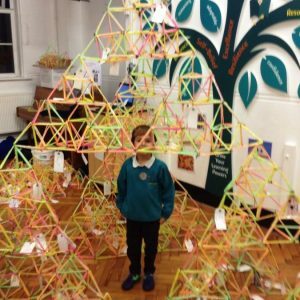 Children and their parents got involved, and were enthusiastic about the activities which included making paper icosahedrons and tetrahedrons, a triangle scavenger hunt and ‘strength-test a triangle’, an activity showing how strong a triangle is in comparison to a square. Parents helped out and chatted and some did activities themselves too.